Best practices for motors and drives maintenance, including electrical and mechanical. Power quality analysis capability to optimize energy usage and reduce losses from machinery. Smart tools to optimize predictive maintenance and reduce downtime. Professionals who want to find out more about power quality, thermal imaging, and vibration condition testing applications relating to predictive maintenance. Elang Kumaran has a Master degree in Electrical System Engineering. With more than four years of experience in the electronic manufacturing industry, his area of expertise includes streamlining workflow and creating an effective teamwork environment to enhance machine productivity as well as conducting training program to enhance machine design. 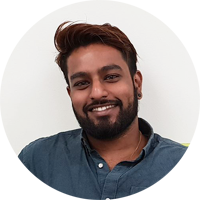 Elang Kumaran is an excellent communicator with recognized abilities in conducting training and is known to deliver the best solution in machine design technology. Upon registration, you will receive an acknowledgement email with payment details. Course fee will include 7% GST and has to be made 7 days prior to the workshop. Missing payment will void your registration. If the minimum number of 10 participants is not met or should unforeseen circumstances necessitate the cancellation of the workshop, full refund will be made to participants who had fully paid the fees or the next available workshop date will be advised. Do you need help to convince your boss to attend this workshop? We’re here to help! Copy the content to email and customize as you see fit, then send it on for approval.